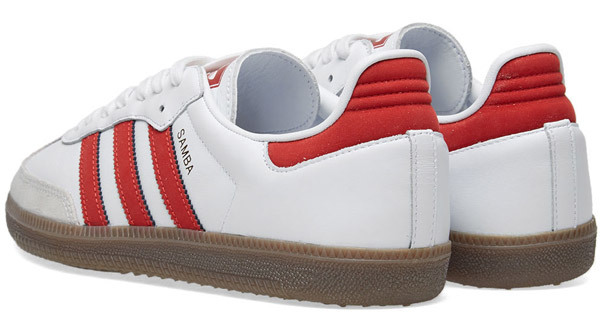 Take your pick of the detailing, but these are the timeless Adidas Samba OG trainers returning in two white leather options. OG meaning original of course and design of this one essentially goes back to the middle of the 20th century. It’s a solid option, with little in the way of fussy details. 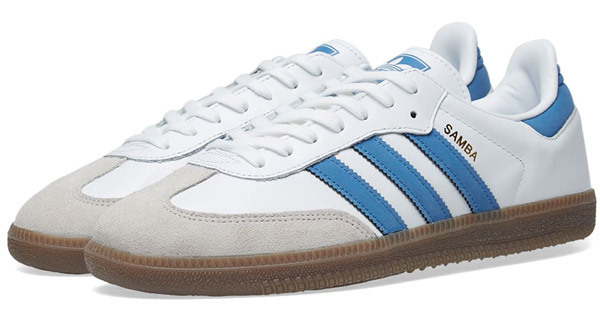 That’s why the Samba is still one of the most popular Adidas designs today – and probably will be for some years to come yet. The model here has full grain leather uppers, which are overlaid with suede detailing at the T-shaped toe cap, all of which sit upon rubber outsoles. Oh yes, some gold foil branding finishing things off as well. The difference between the two is obvious. One has red detailing, the other blur detailing. So take your pick on that one . Price the same for both of these styles, which is £75. Both are available online right now.